Whether flower, kitchen or romantic vision - as varied as gardens types are also garden chairs. A matching designer garden chair should therefore not only be weather-resistant and easy to clean, but also fit the particular garden. 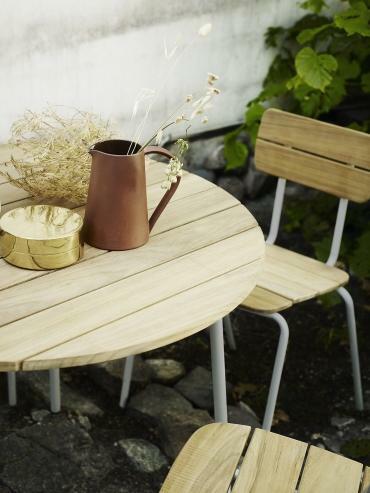 Simple wooden garden chairs, such as the Flux chair or the Skagen armchair from Skagerak harmonize well with nature - and are perfect for anyone looking for a natural and solid aesthetic. On the other hand, additional coloured accents are effortlessly provided by plastic chairs, which, like the folding chair Folding Air-Chair by Magis, are usually easy to store and light. As a contemporary classic among the garden chairs one finds the Vitra Vegetal Chair. A works which fits into any garden. The designers Ronan and Erwan Bouroullec were inspired for the design of the characteristic backrest directly by plant structures, more precisely, the superimposition of leaves and tendrils in the thicket. If you are looking for a special eye-catcher and you still have something for the charm of the fifties, the garden chair Acapulco Chair by Ok Design is highly recommended.